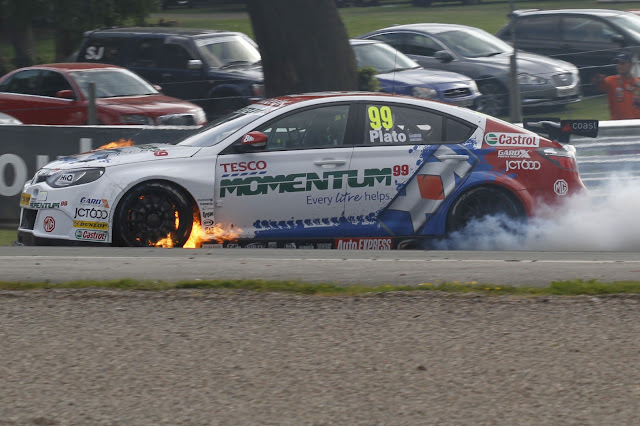 MG KX Momentum racer Jason Plato scored a flawless double BTCC victory at Oulton Park today (9 June) before a dramatic fire put him out of the final contest, handing his Honda Yuasa Racing rival Matt Neal the championship lead. Two-time champion Plato is no stranger to winning at the Cheshire venue, having taken seven victories at the circuit prior to this weekend, and he duly added to his impressive tally. He was in dominant form throughout the event – claiming pole position before securing two lights-to-flag wins in commanding fashion. But for the agony of race three, the Oxfordshire driver was still pleased with his weekend’s work, “I’ve been on fire – literally,” he said in reference to both his fine form and later misfortune! Plato’s young team-mate Sam Tordoff starred in race one by claiming second – the best result in his short BTCC career so far and the first ever one-two for MG KX Momentum Racing.Reigning champion Gordon Shedden took third in the opener before going one better in race two in his Honda Civic, whilst 2009 champion Colin Turkington claimed third in his eBay Motors BMW 125i M Sport. The chaotic final encounter was won by Andrew Jordan in his Pirtek Racing Honda Civic after his team-mate Jeff Smith spun away the lead with just three laps remaining. Turkington scored another podium, rounding out an extremely encouraging weekend for the eBay Motors driver. 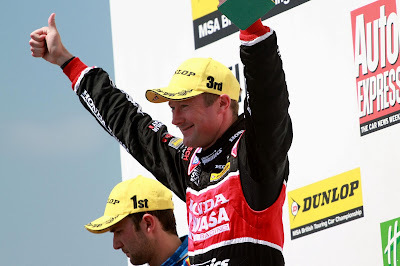 The impressive Adam Morgan took his first ever Dunlop MSA British Touring Car Championship podium in the final race, which was just reward for the Ciceley Racing driver and continues his fantastic form so far in 2013. Matt Neal finished just 0.078s off the rostrum after hounding down Morgan in the closing stages but his race results of sixth and two fourth places were enough for him to leave Oulton Park with the championship lead. 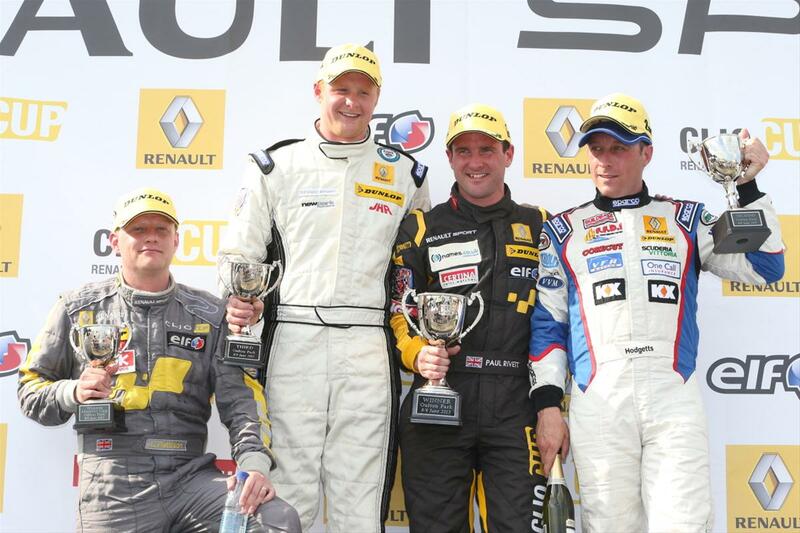 Such is the competitiveness of the 2013 BTCC season that Neal, Jordan and Plato are separated by just seven points at the top of the standings. 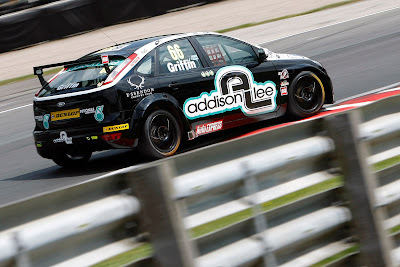 Other notable results belonged to the Rob Austin Racing-run Audis of Rob Austin and Will Bratt – the duo finished fifth and sixth respectively in race three. 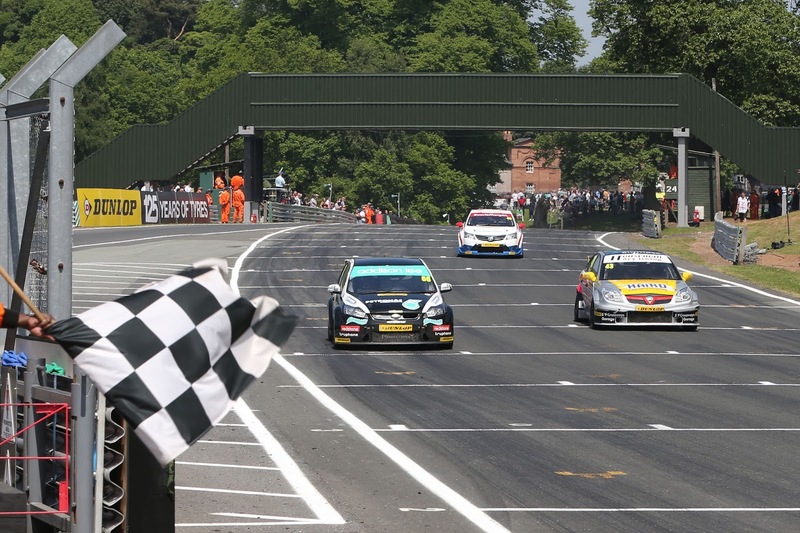 Lea Wood looked set to claim a first ever treble in the Jack Sears Trophy but after taking two wins he was forced into retirement in the final contest, which handed Liam Griffin’s Ford Focus his fourth win of the season. Wood heads the S2000 order with five victories. Further to Neal’s lead in the overall Drivers’ standings, Honda lead the Manufacturers’ Championship and Honda Yuasa Racing also top the Teams’ Championship. Andrew Jordan and his Pirtek Racing squad hold the advantage in the Independents’ Drivers’ and Teams’ standings respectively. 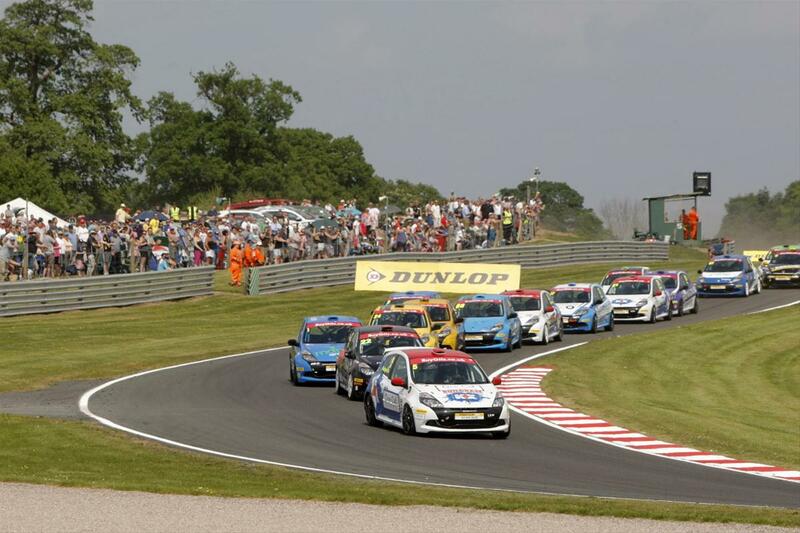 Rounds 13, 14 and 15 of the Dunlop MSA British Touring Car Championship take place at Croft on the 22/23 June. Bentham’s David Wright was robbed of the chance to push for a victory on last weekend’s Dukeries rally when a driveshaft snapped dropping him down the leaderboard. 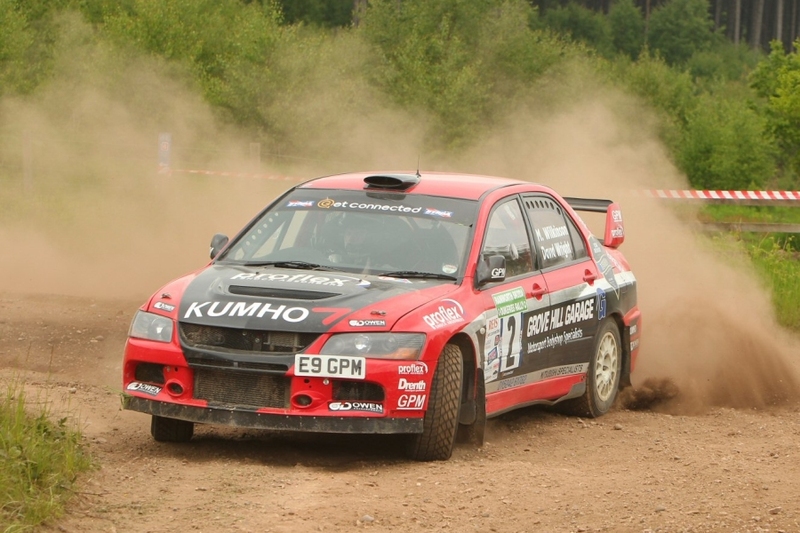 Wright got off to a great start in his Kumho Tyres, Proflex, Drenth, York Brewery, Millers Oils, Owen Developments and Grove Hill Garage-supported Mitsubishi Evo 9 and, after setting the fastest time in stage 5 he was up to second overall, just 11 seconds off the leader. With another five stages still to go Wright was confident of making up the time to take the win but disaster struck on the start line of stage 8 when the driveshaft broke. With no service halt after stage 8 Wright was forced to do two stages with the damaged shaft which dropped him to 13th on the leaderboard. The problem was fixed for the last stage and Wright made it to 12th place and 4th in class. Wright’s next event will be the Nicky Grist Stages in July although he will also be appearing at the Goodwood Festival of Speed as part of the International Rally Drivers Club display. At 10.30am on Saturday 15th June 2013 a spectacle of 4x4 vehicles crewed by 100 adults (and 7 children) will gather at Littlecote House Hotel, Hungerford in Berkshire ready to start out on the 2013 Help for Heroes 4x4 European Rally; a 12 day, 2,000+ mile adventure following the path of the 1944/5 Allied Invasion through Europe. The inaugural rally in of 2010 had a goal of raising £20,000 for the charity; it went on to raise £121,000. The rally has since become an annual fixture in the calendar and has grown to become the largest independent event raising funds for H4H the rally – raising in excess of £600,000 for Help for Heroes. This, its fourth year, has already raised £110,000. This non-speed touring assembly consists of over 40 vehicles and is crewed by serving and ex-military personnel, as well as civilians and families with children. Many of the serving/ex-service participants have served in Iraq and/or Afghanistan. The adventure will be part military history tour (including museums and cemeteries) and part off-road driving, and is open to road-legal 4x4 vehicles. As well as the driving, the teams have to complete daily tasks which include navigation, driving skills, observation, quizzes and competitions. The route uses the byways of Salisbury Plain the Rally, and stops at military bases including before embarking on the Brittany Ferries sailing from Portsmouth to France. In addition to visiting WWII historical areas in Normandy, the H4H 4x4 Rally route will take in the WWI battlefields of the Somme and Ypres. It will then visit Arnhem in Holland and ‘Operation Market Garden’ before heading south to Bastogne in Belgium where the Germans made a final push – the famous ‘Battle of the Bulge’. The journey continues to the Alsace region of France - with its Maginot Line fortifications. The route then journeys into Germany and Dachau Concentration Camp Memorial; with its horrors of war. The event concludes 12 days after leaving the UK – the final part being a visit to Hitler's "impenetrable" Eagle's Nest high in the Bavarian Alps at Berchtesgaden. Another challenging weekend for Airwaves Racing ended with a glimpse of promise this weekend (June 8/9) during round 4 of the Dunlop MSA British Touring Car Championship (BTCC). 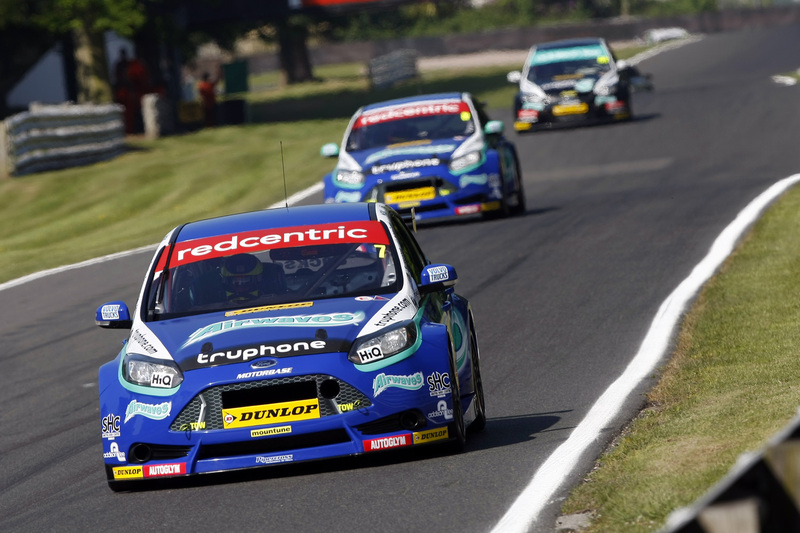 Cheshire’s picturesque Oulton Park circuit provided the backdrop to a drama filled race weekend that saw the Airwaves Racing squad suffer yet another run of torrid bad luck; securing two top ten finishes; despite showing promising pace in the Mountune-powered Ford Focus ST next generation touring cars. An uneventful qualifying session on a blistering track on Saturday afternoon left the Airwaves Racing drivers with much work to do during Sunday’s three races. Mat Jackson and Aron Smith ended the session in P11 and P17 respectively; as Smith’s #8 Focus struggled with an intermittent engine fault that hindered the Irishman’s progress throughout the session. Sunday’s opening race started well, with both Jackson and Smith making good ground through the pack in the opening laps. The good news proved to be short lived however as the Smith’s engine fault kicked in during lap 4, relegating the Irishman through the ranks - eventually forcing the #8 Focus into the pits for an early retirement. 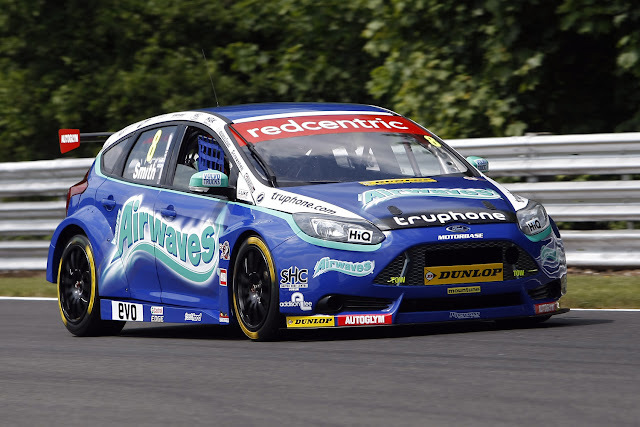 The #7 Focus ST’s improved pace and set up paid dividends for Airwaves Racing team-mate Mat Jackson, with the 32 year old managing to pick his way through the field to cross the line in 7th position. A momentous effort in the Airwaves Racing garage to pull a rabbit out of the hat during the midday break, saw the Motorbase crew successfully changed Smith’s engine against the clock in an impressive 1 hour 15 minutes; allowing the Irishman to join the back of the grid for the start of race 2. The team’s hard work was rewarded with a sterling drive from Smith – making up an impressive 11 places to come home in P14. Jackson looked to be on for a strong top 5 finish during the opening laps, when disaster struck once again following a coming together with Tordoff’s MG – causing damage to his #7 Focus which could only manage a crawl to the finish to end race 2 in P20. With a new set up and last minute coolant repairs to Smith’s Focus forcing a pit lane start; both Airwaves Racing NGTC’s started the final race of the day from the back of the pack. Once more, both Airwaves Racing drivers showed their remarkable race craft as they picked their way through the packed grid, battling to the mid field within the first eight laps – with Smith collecting an, albeit short-lived, fastest lap time on the second lap. As has been the story too frequently thus far this season, luck played a cruel trick on the Airwaves squad once more, with Jackson’s charge through the field thwarted by a similar issue to the damage experienced in race 2 – forcing an unscheduled pit visit and return to the back of the pack. Despite a gallant effort from Jackson, it proved too little too late and the #7 Focus could only muster a P19 finish for the last race of the weekend. Smith’s final race of the day proved to be more positive, with the Airwaves Racing driver producing a stunning drive from the back of the grid to secure the team’s second top ten finish of the weekend and some much needed championship points. Liam Griffin on his way to a Jack Sears Trophy win. Addison Lee Motorbase team-mate Liam Griffin had a more successful weekend to further boost his Jack Sears Trophy campaign; collecting another two class wins in his S2000 Focus ST during Sunday’s opening and closing races. A judicial reversal of the opening race results leaves Griffin just one race win off the top spot now, with everything still to play for at the next round. Despite suffering another frustrating weekend, the Airwaves Racing squad have made promising steps forward with the pace and set up on the NGTC Focus ST’s and now have a two week break to put the lessons learned this weekend into practice before the racing gets underway when The Dunlop MSA British Touring Car Championship returns for round 5 at North Yorkshire’s Croft circuit on June 22/23. “As bad weekends go, that has got to be right up there. We just haven’t had a break - despite being confident we had made good progress leading up to and during this weekend. Fundamentally a poor qualifying result hurt us amongst a very competitive top twelve. “We’ve really made progress with the car this weekend. I think we would have had three top five finishes this weekend, but performance wise we had a few issues that cost us that, which is a real shame but we’re still learning. “It’s been a little bit of a troubling weekend; and it’s unfortunate because we’ve done so much testing and developed the car so much from where we were – but we just never got to show our hand to be fair. “All in all I’m pretty happy with the weekend. Race 1 was a bit disappointing with the result being reversed, but the ying and yang came through with us getting another win in race 3. 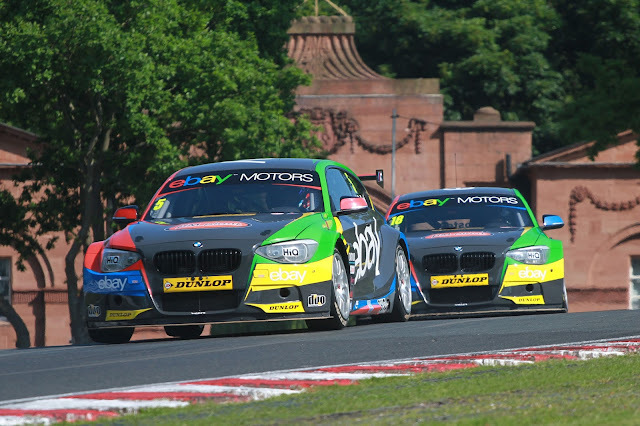 The eBay Motors team secured a return to the podium with Colin Turkington enjoying a second and third place finish as the Dunlop MSA British Touring Car Championship season resumed at Oulton Park after a five-week spring break. Alongside the strong outing on-track, eBay Motors also enjoyed a successful weekend away from the circuit following the debut of the eBay Motors Hub Live – a new interactive zone allowing race fans to get closer to both the team and the sport with a special four-person simulator, Q&A sessions with the drivers, trophy photo opportunity, download terminal for the eBay Motors app and the chance to collect a free eBay Motors Team cap. Paul O'Neil, local lad and winner of Oulton Park in 2002, hosted the drivers in Hub Live and entertained the crowds, with the drivers answering his questions and being on the receiving end of his fun jokes. 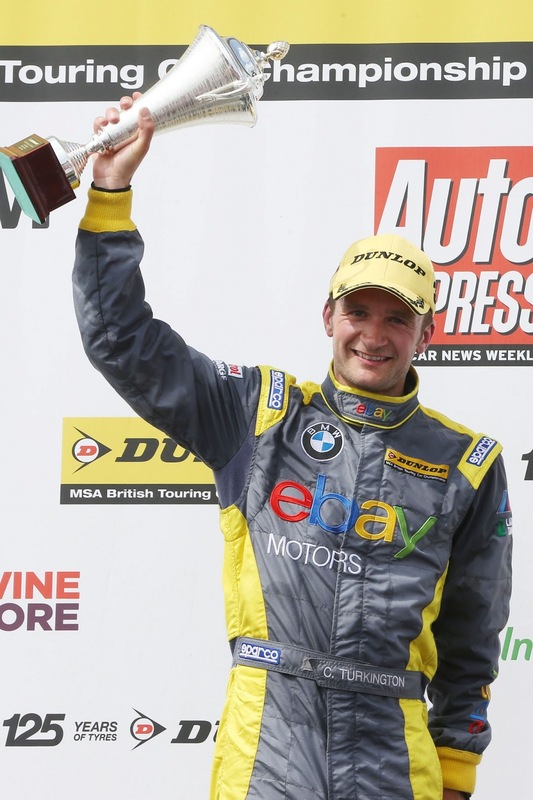 Having worked to make improvements to its NGTC-spec BMW 125i M-Sports in a series of tests during the break, the team was able to add to its collection of silverware, with 2009 title winner Colin Turkington bringing home a brace of top three finishes. 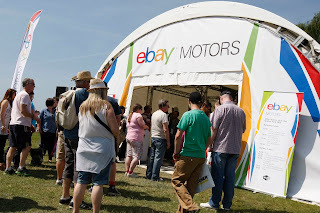 Colin led the eBay Motors challenge in qualifying to put his car seventh on the grid, with team-mates Rob Collard and Nick Foster with more work to do on race day from 16th and 22nd respectively. A solid run in the opening race saw Colin take the flag in fifth place, with Rob also lapping strongly to cross the line in tenth, despite a scare when Tom Onslow-Cole’s VW got out of shape ahead of him at Druids mid-race. Nick however was the undoubted star as, having elected to run the Soft compound Dunlop tyre in the opening race, he stormed through the field to take twelfth – making up no fewer than ten places in the process. Race two saw Colin make a strong start to run in the top three before an opportunistic move from Honda’s Gordon Shedden demoted him to fourth just before a Safety Car period that bunched up the field. Pushing hard on the restart, Colin was able to get ahead of Sam Tordoff’s MG to take his second podium finish of the campaign. Although the reverse grid draw for race three left him eighth on the grid, Colin was able to secure further podium glory in race three with a strong drive through to second place while there were more points for both Nick and Rob as they took the chequered flag in eighth and eleventh following a hectic race in the midfield. Following the weekend, Colin sits sixth in the championship standings with Rob and Nick in 16th and 17th, while eBay Motors hold fourth in the HiQ Teams Championship having picked up its biggest points score to date from the trip to Cheshire. 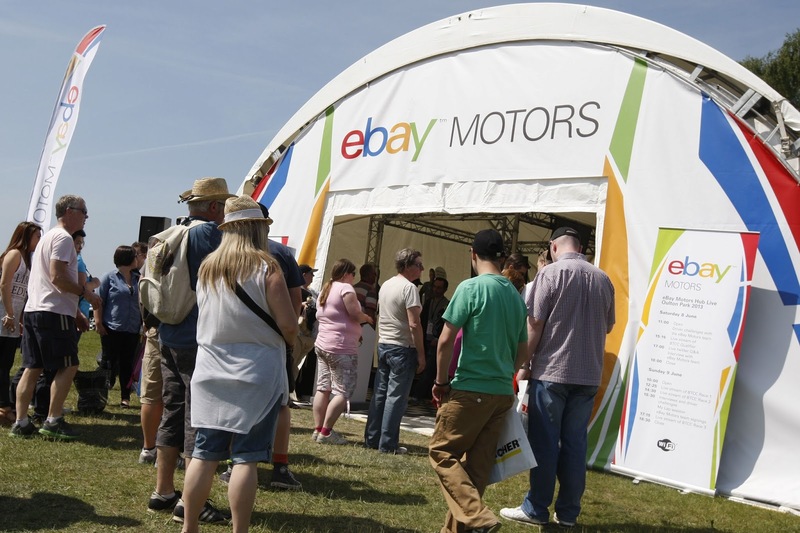 The eBay Motors Hub Live will be back in the paddock at a number of events later in the year. 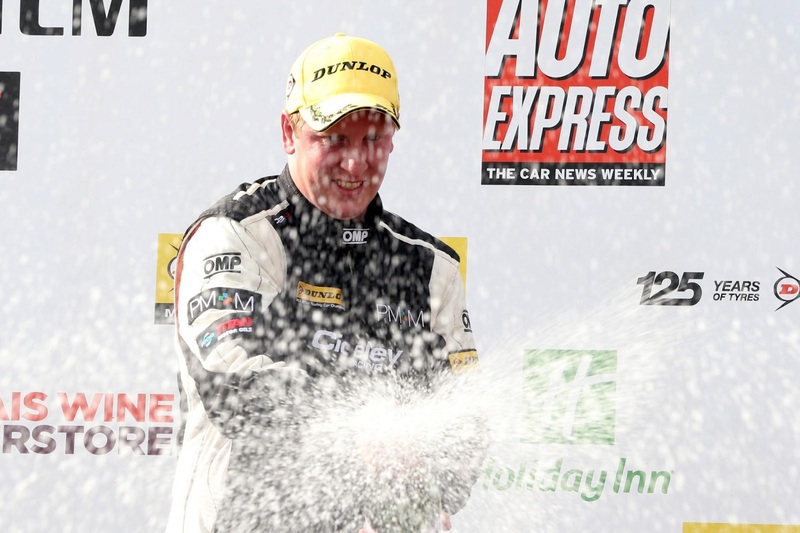 Toyota Avensis racer Adam Morgan is celebrating his maiden BTCC podium finish after a gutsy drive to third place for Ciceley Racing in the final race of the Dunlop MSA British Touring Car Championship’s Oulton Park raceday. The result was not only a personal best for the 24-year-old from Lancashire on his home circuit, but also the best BTCC finish so far this season for a Toyota driver. Morgan’s success came at the end of another remarkably consistent day for the Toyota independent - he finished ninth and seventh in the earlier races to maintain his run of form. He’s one of only four drivers to have scored in every race and has claimed a top-10 result 11 times from 12 starts. Adam’s podium charge saw him battle past Adam Welch’s Proton for third in the early laps to latch on to the tail of the lead battle, being disputed by Jeff Smith’s Honda and Rob Austin’s Audi. Smith ousted Austin from the lead at mid-distance and Morgan followed him through for second before being returned to third by Andrew Jordan’s Honda. 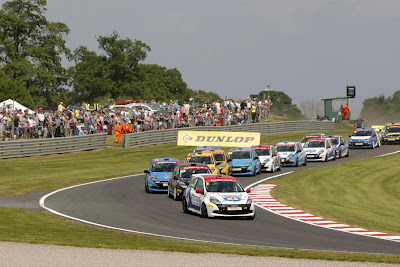 Jordan went on to win from BMW driver Colin Turkington, with Morgan holding off a determined challenge from multiple champion Matt Neal (Honda) by just 0.078s at the line. There was a strong showing today also from the Speedworks Motorsport team and in particular Dave Newsham, who scored his and the team’s best results of the season - fourth in qualifying and eighth and sixth respectively in races one and two. Unfortunately a thump from another car led to a spin in the finale after he showed strong early pace. “We have really turned a corner with the Toyota,” said Newsham. “It’s better to drive and we showed we had a good qualifying car. Today, we struggled in race one but made changes and now we have a good race car as well, so I feel very positive for the future.” His team-mate, Ollie Jackson, scored his first point since the season-opener at Brands Hatch with 15th place in race three. rejoined a lap down and finished 23rd. 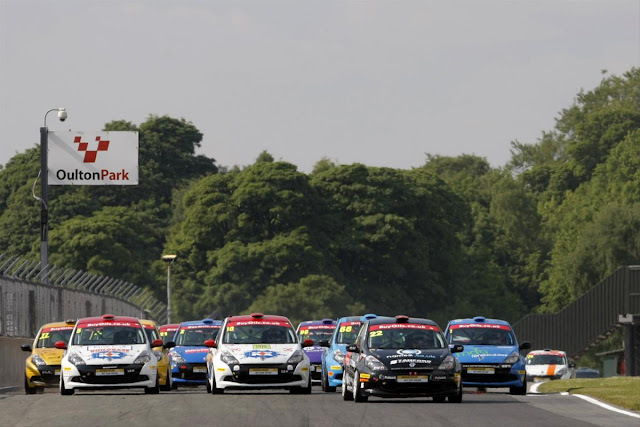 Toyota’s quartet of independent racers will be back in action in a fortnight (23 June) at the Croft circuit in North Yorkshire. Honda Yuasa Racing maintained its lead in all the major Dunlop MSA British Touring Car Championship standings despite a trying event at Oulton Park last weekend. The Honda Civics of Matt Neal and Gordon Shedden again handled well around the Cheshire track, but success ballast from previous rounds and low turbo boost levels thanks to the championship’s engine equalisation system made life tricky. 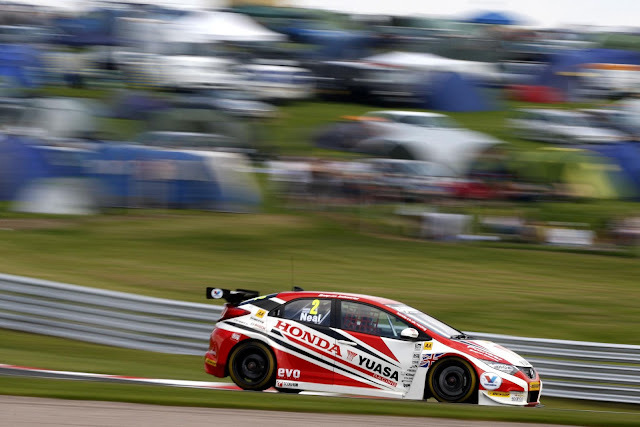 Shedden qualified third after having his best time disallowed for exceeding track limits, while Neal – running with the maximum 45kg of ballast – was eighth quickest. Reigning champion Shedden tracked the leading MGs relentlessly in race one to finish third and then went one better second time out to grab the runner-up spot. 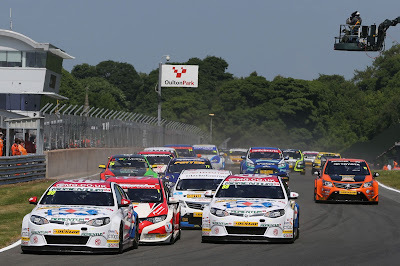 He was in the jostling lead pack in the reversed-grid encounter, which he started on the BTCC’s soft tyre, before contact with a rival punctured a tyre and sent him to the pits. “Splitting the MGs was good in race two,” said Shedden, who remained fourth in the drivers’ standings. “The car has been fantastic all weekend and we maximised what we had. 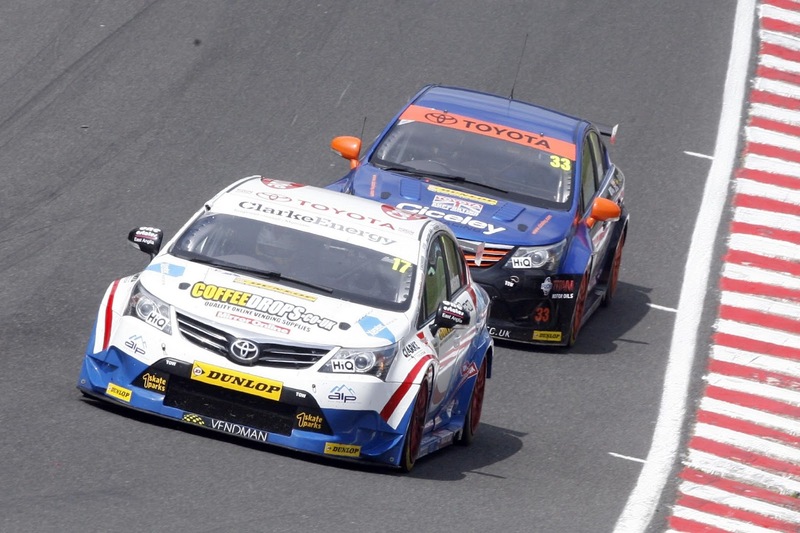 Neal battled his way to sixth in race one and, with no ballast for race two, improved to fourth in the second event. After a battling drive in the finale, which included a dramatic fight with former champion Colin Turkington, Neal came home fourth to hold a four-point lead over Pirtek Racing Honda driver Andrew Jordan in the title race. “The weight and the boost made it hard,” said the triple champion. “You’ve got to drag the weight up in four places here. “When we had the weight out for race two we made a set-up change that didn’t quite work and we didn’t reap the benefits. As well as holding first and fourth in the drivers’ championship, Honda Yuasa Racing also maintained its lead in the teams’ championship. To complete the set, Honda leads the manufacturers’ standings and Jordan and Pirtek Racing head the independents’ championships. 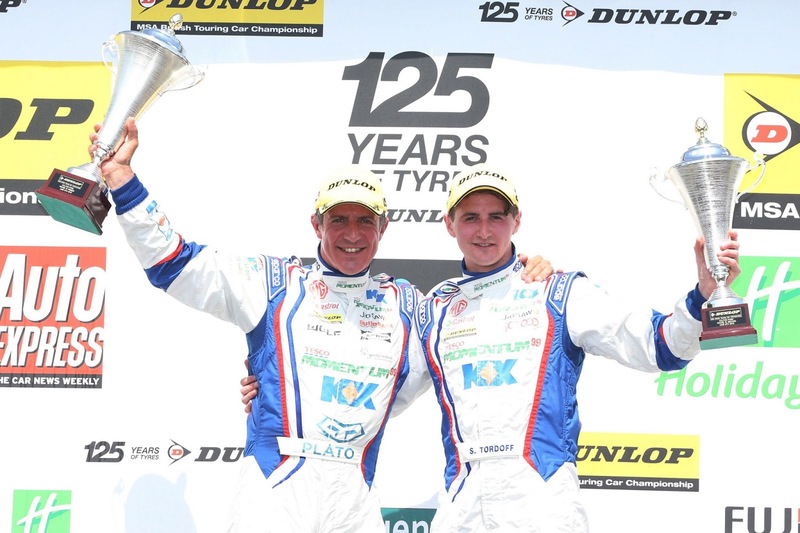 Jason Plato thrust himself right into the heart of the fight for this season’s 2013 Dunlop MSA British Touring Car Championship by taking his MG KX Momentum car to two stylish wins at Oulton Park in Cheshire on Sunday. The former champion was the highest points scorer across the weekend’s three races, but was ruled out of the final event when damage caused his car to erupt in flames. Plato’s team-mate, Sam Tordoff, underlined the team’s competitive showing in Cheshire by landing the best result of his career to date when he followed his sister car over the line in the opening race. Plato said he was delighted to have turned the car’s potential into a big points pay day with his 77th and 78th career victories in Britain’s leading motor racing championship. Tordoff was all smiles after the opening race of the weekend. The Leeds ace, a member of the KX Akademy, banked a career best second place finish behind Plato after a brave opening lap. He ran side-by-side with a rival through the first two corners before securing the spot. He failed to finished the second event after a brush with another car – incredibly, Tordoff’s first non-points finish of the season – before staging one of the drives of the weekend to go from 21st to seventh in race three. “I was delighted with the podium in the opening race and, as Jason says, it underlines the progress we have made in the car throughout the year,” explained Tordoff. “I was still able to push at the end of the first race if I had needed too, but fortunately, I didn’t have to. I went with the softer option tyres in race two, which went off towards the end and I dropped back before the contact. “Race three was really good fun, and that shows what we are capable of – I think if I had have started in the top ten, I could have won that race,” he added. 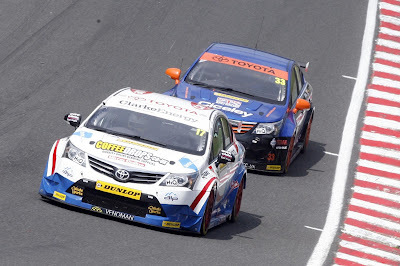 Tordoff consolidated fifth place in the standings, while Plato has moved to within seven points of the title summit as the title fight reaches its halfway point at Croft in North Yorkshire in two weeks’ time. MG KX Momentum team principal Ian Harrison said he thought that the team had exploited its chances with the wins at Oulton Park. 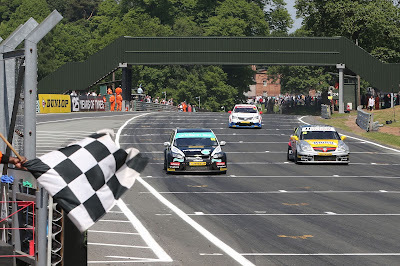 Paul Rivett (Banstead) soaked up immense race-long pressure from Stefan Hodgetts (Redditch) during the seventh round of the 2013 Renault UK Clio Cup at Oulton Park this afternoon, Saturday, 8th June, to seal his third victory of the year with a faultless lights-to-flag drive. Making his pole position grid slot count, the Names.co.uk/Stancombe Vehicle Engineering racer produced a fantastic start to lead but – with the exception of a brief Safety Car period – never had a moment to rest. Hodgetts’ KX Racing with Scuderia Vittoria car was an ever present threat, never more than half a second behind the three-time champion, and to confirm his pace Hodgetts took the two bonus points for fastest lap, thanks to a time of 1m36.705 seconds (82.86mph) on lap 12. Josh Cook (Bristol), who didn’t enjoy the best of starts from the front row, slipped to third on lap one but was thereafter able to run very similar lap times to both Rivett and Hodgetts. For the bulk of the 15-lap encounter, the JHR Developments driver was in the wheeltracks of the two leaders but just wasn’t quite able to mount a challenge. Even so, third gave him his first Graduate Cup win of 2013. With Team Pyro’s Josh Files (Norwich) finishing in seventh position, having started the first race of the weekend in eighth place, Rivett was able to increase his lead in the championship to 19 points, having been only three points clear prior to round seven. “Of all the people to have behind you in the Clio field, Stef [Hodgetts] is probably the hardest and he didn’t make that easy by any means at all”, commented Rivett, “I had to defend from him into the last corner of the last lap, otherwise I knew he’d really be trying to stick it up the inside. While Rivett led clearly through Old Hall at the start, Cook’s sluggish getaway dropped him into the clutches of both Hodgetts – up from fifth on the grid after a superb start – and his team-mate Ant Whorton-Eales (Lichfield) who ran side-by-side through the first right-hander. Hodgetts emerged in second place while Cook clung on around the outside at Cascades to edge ahead of Whorton-Eales for third. From that point forward, nothing changed among the podium places with the top three incredibly evenly matched. Whorton-Eales’ involvement came to an abrupt end on lap two at the chicane when he tagged the tyre stack, leading to a three lap Safety Car period. When the racing resumed, the lead trio were able to edge back away from the rest of the pack which was headed by Pyro’s Alex Morgan (Reading). Although Morgan slipped two seconds shy of the podium places by the end, he was able to pull over three seconds clear of JHR’s Masters Cup class winner Lee Pattison (Liversedge) who was heavily pressured by Westbourne Motorsport’s James Colburn (Worthing) during the closing stages. Files, who was passed for seventh brilliantly by Jake Giddings (Wisbech) on lap eight at Old Hall, managed to return the favour to the Finesse Motorsport driver on the final tour with Mike Bushell (Tunbridge Wells), on his first weekend driving with KX Racing colours, taking ninth. The battle over the final place in the top 10 was hugely entertaining throughout, half a dozen drivers all within a chance of taking the position. 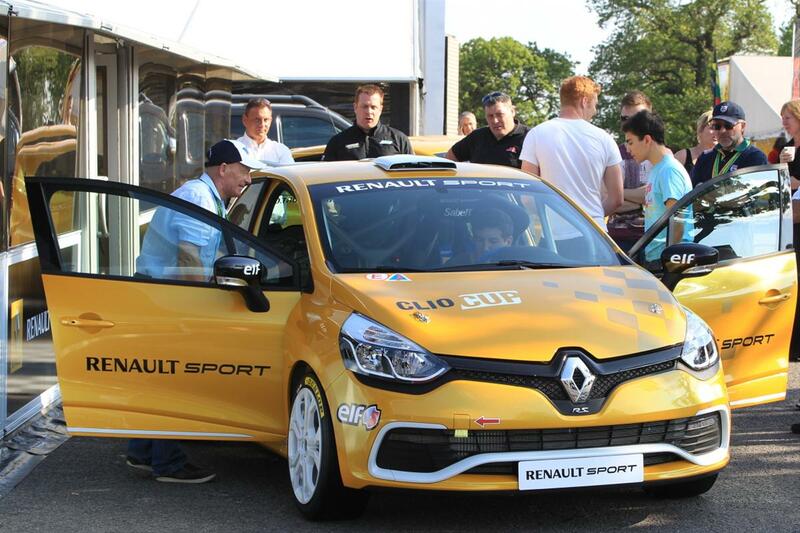 In the end, Clio Cup rookie Ash Hand (Nuneaton) sealed the spot for Pyro by just 0.2 seconds ahead of Jordan Stilp (Potterspury), Devon Modell (Maidstone), James Nutbrown and Simon Belcher (Swindon). Rob Smith (Telford) was also in the thick of the titanic battle at the tail end of the top 10 but sustained a right-front puncture after hitting debris left behind from Whorton-Eales’ incident at the chicane, dropping him to 15th place. Renault UK Clio Cup front-runner Stefan Hodgetts (Redditch) claimed a richly deserved second victory of the 2013 season at Oulton Park Island Circuit this afternoon, Sunday, 9th June, during round eight of the championship – the halfway point of the campaign. In front of the live ITV4 cameras, and tens of thousands of spectators enjoying glorious sunshine, the KX Racing with Scuderia Vittoria driver took the lead at the exit of the first corner after a blistering start from fourth on the grid and delivered an inch-perfect performance despite huge pressure. “It’s fantastic”, said Hodgetts, who earned the ‘BuyOils.co.uk Driver of the Event’ accolade, “We started P4 and, if you say about it Motocross-style, we got the hole-shot at the start. When you’re in the lead in these cars you can kind of control the race but, in order to do that, you need a fantastic car. We’ve been really fast all weekend, it’s just desserts we got the win. Pole-sitter, and championship leader, Paul Rivett (Banstead) had problems with a slipping clutch at the beginning which compromised his getaway. Although managing to see off the quick-starting Alex Morgan (Reading) initially at the exit of Old Hall, the Team Pyro driver hit back on lap two into the hairpin and held on to an excellent second place from that point forward. While Morgan’s runner-up spot, his fourth podium of the year, moved him into second place in the championship ahead of team-mate Josh Files (Norwich), Rivett’s third position was enough to see him marginally increase his advantage at the top of the standings to 22 points. Hodgetts’ launch away from the second row was outstanding and although Morgan appeared to have the lead into Old Hall, the KX Racing driver was able to bravely move ahead around the outside while Rivett – recovering well from his difficult getaway – followed Hodgetts through on the outside line, taking second on the run down The Avenue and into Cascades. Into lap two, Hodgetts, Rivett and Morgan were nose-to-tail and into the hairpin Rivett thought about looking to the outside of the race leader. In doing so though, the Names.co.uk/Stancombe Vehicle Engineering driver left the door open for Morgan to edge up the inside. There was absolutely nothing to separate the top three throughout, Hodgetts smartly backing the others up lap after lap. On lap eight the Safety Car was deployed, following an excursion into the barriers at the top of Clay Hill for Ronnie Klos (Market Harborough), but after the re-start nothing changed at the front with Hodgetts, Morgan and Rivett covered by just 0.7 seconds at the finish. The end of the race actually came one lap early when Finlay Crocker (Bathgate) made contact with the barriers at the top of Deer Leap, bringing out the red flags, just moments after Pyro team-mates James Nutbrown and Ash Hand (Nuneaton) had tangled at Druids. Reflecting on his third place, Rivett said: “It was probably quite lucky I didn’t slip any further back at the start to be honest, once we got going in the race it was OK but at the start the clutch just didn’t bite and that really cost us. Behind the lead trio, Finesse Motorsport’s Jake Giddings (Wisbech) produced a star performance with fourth – giving him his first Graduate Cup win of the season. After taking fourth place from JHR Developments’ Lee Pattison (Liversedge) on lap one, Giddings was a consistent threat to the podium placings but just wasn’t able to carve open an opportunity. Pattison finished fifth, taking his second Masters Cup victory of the weekend, ahead of team-mate Josh Cook and Westbourne Motorsport’s James Colburn (Worthing). KX Racing’s Ant Whorton-Eales (Lichfield) made amends for his non-finish on Saturday with eighth while Total Control Racing’s Rob Smith (Telford) was ninth, just seeing off Files – the latter taking the extra points for fastest lap. There are only two weeks to wait until the next outing for the Renault UK Clio Cup competitors with rounds nine and 10 of the 2013 campaign taking place at Croft in North Yorkshire on 22nd/23rd June. , the new Clio will come fitted as standard, for the first time, with a steering wheel mounted paddle-shift gear change system.